Language Log » Oh my melon! Bryan Van Norden is a Visiting Professor at Wuhan University this semester, and he ran across an interesting bit of language play. Below is a still (taken with his cell phone) of a television commercial currently running in the PRC. It is for a watermelon juice drink. As you can see, the tag line is a bilingual pun, substituting guā 瓜 ("melon") for "God." Some Language Log readers may remember Bo Guagua ("Melon Bo"), son of the archvillain, Bo Xilai, who was brought low by the current president of China, Xi jinping. 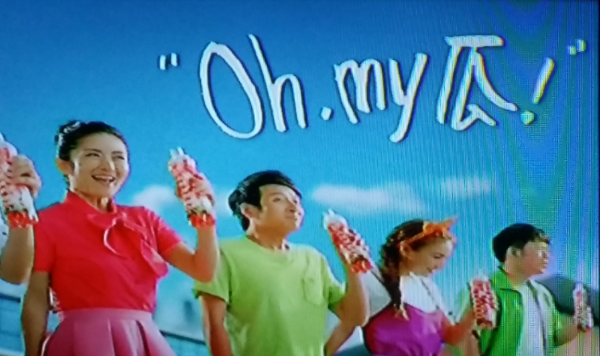 It seems that practically everyone in China, at least those under around forty, knows how to say "Oh, my God!" and what it means, though they usually write it as "OMG". There was (is?) a Voice of America program called OMG! Měiyǔ OMG! 美语 ("OMG! American English") hosted by Jessica Beinecke that was (is?) very popular in China and Taiwan, so that is one vector through which OMG would have become widely known. "Oh, my God!" is sometimes also written in Chinese characters. Fundamentally, these are transcriptions of the sounds of the English words where you're not supposed to think of the surface significations of the characters, but they also sometimes simultaneously convey a zany or clever meaning that adds a special flavor to the transcription. Cf. ōu mǎi gà 欧买尬, which is the same as the previous version except for the interjection at the beginning, although this is in simplified characters, whereas the former version is in traditional characters. Gà 尬 is one of those characters that, by itself, doesn't mean anything. It only means something as part of the word gāngà 尴尬 (var. 尲尬) ("awkward; embarrassed; discomfited; ill at ease; clandestine / secretive"). While gà 尬 undoubtedly, perhaps subliminally, carries some of the nuances of "awkward", etc., in the exclamation "ōu mǎi gà 欧买尬", it is mainly functioning strictly to convey the sound of "God" (sans the final -d, which doesn't exist in Mandarin). Again, gā 咖 is a character that, by itself, doesn't mean anything. It only means something as part of the word gālí 咖喱 (a transcription of the English word "curry", which is itself a translation of the Tamil word kari (கறி) meaning "sauce") or as part of the word kāfēi 咖啡 (a transcription of the English word "coffee", which is itself a transliteration of the Ottoman Turkish word kahve [I won't try to trace it back beyond that to Arabic, since the derivation is vexed and complicated]). My favorite is the last one, for two reasons: 1. it gives us a sense of God's activity, 2. it doesn't neglect the final -d of his name. One Chinese blogger has even gone so far as to declare that gàode 告的 is the British pronunciation of "God", while gāde 嘎的 is the American pronunciation of "God". Just looking at the words, I was reminded of Orff's Carmina Burana, and the poem that Orff gave top billing in his orchestration: "O Fortuna". The poems in Carmina Burana were all written in Latin or Old High German, in the 12th Century or so, and therefore they don't make much sense to American audiences (who hear Orff's piece quite frequently — it's 20th-Century music, and a favorite of choirs). One of the funniest and most popular videos on the Web these days is an animation of a "bad ear-reading" of the lyrics to "O Fortuna". I wonder how often ua and a are interchangeable in dialects and premodern pronunciation. My daughter will love this ad because she loves drinking fruit smoothies and she always refers gua 瓜 melon as ga.
Is it possible to say "买个" by itself to mean "buy one"? It's certainly possible to say "买个 ", but I have a funny feeling that without a following noun phrase I should say 买一个. Is there someone who can say one way or the other? My angle brackets were eaten. I wanted to say "It's certainly possible to say '买个 (noun phrase)'". "Don't know about ua/a, but isn't o commonly pronounced as uo (eg bopomo etc)"
Yes, but not in English, and it's the various English pronunciations they are trying to approximate. 买个 means “purchase physical stature”.